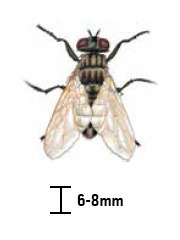 Adult is 3.5 – 6mm. Has 3 brown stripes on the thorax. Like to live in decaying organic debris, including carcasses, and animal manure. Found often in food service facility bathrooms. Drying the areas of breeding. 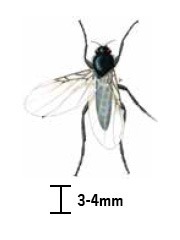 Have a dull thorax with a metallic abdomen. Often used in deciding time of death in crime scene investigation. 1100 species worldwide. Sanitation as in removal of breeding material (carcasses). Removal of the dirt or area adjacent if available. Thorax usually lacking distinct stripes but possesses numerous wrinkly yellow/golden hairs (may be absent in older specimens). Abdomen with irregular lighter areas. Larvae parasitize earthworms. 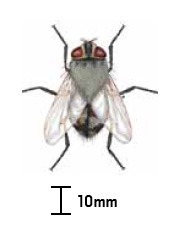 During cold weather, large numbers of flies aggregate within attics and structural voids (with warm temperatures-emerge indoors). 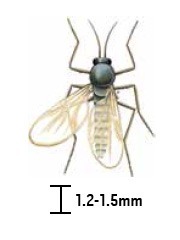 Exclude through sealing and appropriate insecticidal treatment of openings leading into void areas. Window Wonder Trap with Cluster Fly Lure at the base of windows (especially on western and southern exposures). Place Window Wonder Trap with Cluster Fly Lure in walk-up attics or above suspended ceilings where Cluster flies are observed. PestWest Insect light traps are very effective. Dark in color almost black. Pollinators. Larvae feed on fungi, frequently associated with plant roots, aid in decomposition. Typically found in overwatered houseplants. Look at plants with secondary decorative pots. Look for plants inside that were recently brought indoors or have had potting soil changed recently. Tan color with abdominal stripes. 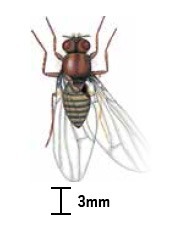 Fruit fly is widely used in genetic research. Window Wonder Trap for floor-level monitoring and secondary control. Demi Diamond for elevated spatial, walk-by monitoring and secondary control (add desired lure such as malted vinegar to the 30 ml reservoir at the bottom of washable station). PestWest Insect light traps are effective. Adults vary in size 5-16mm. Slender body with long legs. Vectors of many human and animal diseases. Immature stages live in a variety of moist environments. Drain water in containers and pool areas. Be sure screens are in good shape. Keep vegetation to manageable levels, especially next to water. 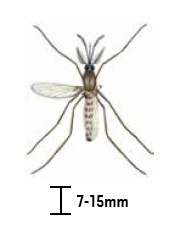 Use protective creams containing DEET on the outside. Adults vary in size 15-20mm. Black head and thorax, black and yellow patterning on abdomen. 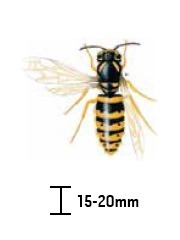 PestWest sticky traps and electronic fly killers are particularly effective at attracting and controlling wasps. 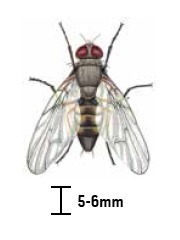 Dark flies humpbacked in appearance. Wing veins have a dark edge in the first cells. Have a habit of ‘running’ before they fly. 3000 species in 230 genera. Can be found in carcasses. Look for areas with decaying organic debris left for more than a few days. Will swarm in large numbers and inflict bites. Insect repellents should be used when outdoors to prevent bites. 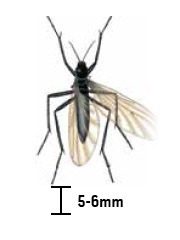 Chameleon® sticky traps will attract and control midges. 4 longitudinal stripes on their thorax. Underside of the abdomen is yellow. Red compound eyes (males are closer together). 4th Large wing vein has a sharp upward bend. Live in moist organic debris. Capable of carrying and possibly transferring over 100 different human pathogens. The life cycle speeds up in warmer temperatures. 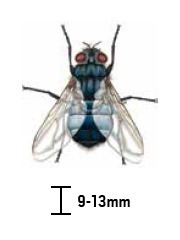 Please click HERE or image to download “Fly Identification”.